Nine elegant shop windows right in front of Palazzo Strozzi and rooms with different colour impressions for Giorgio Armani's Florentine boutique. 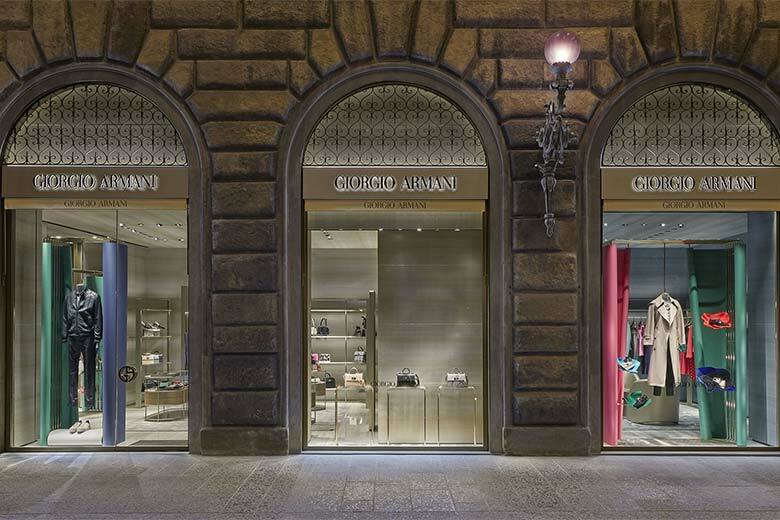 Giorgio Armani’s Florentine boutique, previously located at no. 48/r in Via de’ Tornabuoni, has moved to no. 83 in the same street, right opposite the prestigious Palazzo Strozzi. The space covers an area of 250 square metres on a single floor. The nine shop windows looking out onto one of the most elegant streets in the historic centre ensure the brand has excellent exposure. The architectural concept, spacious and bright, has been conceived by Giorgio Armani in association with his team of architects and respects the building’s original structure, developing in a succession of rooms that are connected thanks to elegant portals with platinum finishes. All the rooms have been personalised: in each room, the various colour tones of floors, silk panels and drapery create a dialogue with each other in a fascinating interplay of chromatic references. The furnishings and display units are made of resin and platinum coloured metal, light and curved, while the lamps, wall coverings and carpets are all designed by Armani/Casa. Here you can find King Giorgio’s entire creative universe, from men’s and women’s clothing to accessories, for which a large area has been reserved. A corner and a display case, on the other hand, are for the make-up and fragrances line of the Armani Beauty selection. «Florence has retained all its charm and the splendour of the past and is a genuine meeting point for tourists coming from all over the world. I wanted to create a boutique that mirrored the brand’s aesthetic values, with an atmosphere that was both elegant and inviting at the same time», Giorgio Armani explained on the occasion of the opening of the new space. «The sequence of colours in the various rooms, the meticulous distribution of the products and the new space dedicated to the Giorgio Armani Beauty line give rise to a typically Armani experience: rich, multisensory, sophisticated and natural».